The new Nexus 5X began shipping earlier this month! My new Nexus arrived a few days ago so it's time to make some teardown notes. Can I replace the (fixed) battery myself? What battery does the phone use and how much does it cost? Can I add wireless charging capability? 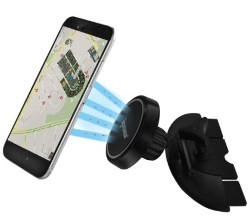 Can I add an internal metal plate for magnetic car mounts? First I should say that I'm so very pleased Google continues to offer Nexus tablets and phones with "stock" Android installations. Unlocked devices. No addware. No bloatware. Just give me my device and let me decide what extras to install -- that's what Nexus devices provide (except for root access, but that's a security topic best tackled in another post). Thank you, Google. One reason I've leaned toward Android phones over iPhones is versatility. A majority of Android phones feature a removable cover with a user-replaceable battery. This is good for switching to larger batteries or for simply replacing the stock battery when it begins to wear out. On my Samsung Galaxy S4, for instance, I was able to replace the stock battery with a double size battery (and extended battery cover) for under $15. Compare that to the $79 Apple charges to replace an iPhone battery. Unfortunately, both the new Nexus 5X and Nexus 6P have fixed batteries. The 5X, however, isn't entirely a lost cause when it comes to the battery (more on that, below). Another common Android value proposition has been that you could purchase a "basic memory-sized" phone and expand memory as-needed on the cheap by adding a MicroSD card. For example, don't pay an extra $100 for that 64GB iPhone 6S just to get 48GB more memory over the basic 16GB model. Instead, go Android and pay only $20 for an extra 64GB of memory via a MicroSD card. That 0.48 GB per dollar of extra iPhone memory (versus 3.2GB per dollar for MicroSD memory on Android) works out to be over 6 times higher cost for Apple memory expansion. Google, though, appears to want to drive new Nexus users to cloud storage rather than provide users the ability to choose cheap local storage. Boo. The Nexus 5 phone has a camera with OIS. OIS helps combat blurry photos caused by camera shake, and camera shake is par for the course with hand-held cameras. OIS is found on most every mid-to-high end consumer camera and was also included on the Nexus 5. 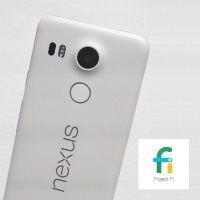 The new Nexus 5X, however, drops OIS -- presumably to help keep costs down. Google says it is no longer needed due to other enhancements but the fact is OIS continues to be a benefit in photography and dropping it definitely reduces the value of the Nexus 5X's otherwise well-regarded 12MP camera. Question #1: Can I replace the battery myself? Although not designed for end user access, the back cover of the Nexus 5X can be opened relatively easily using a typical medium-hard straight edge. The "guitar pick" tool -- pictured to the right -- found in many inexpensive (under $10) cell phone repair kits will do the trick without damaging the case. The battery itself has adhesive holding it to the main case but the bond is not permanent and the stock battery is easy to pry away. The main item to note is that part of the interior framework must also be removed (unscrewed) in order to plug/unplug the battery. Fortunately the screws used are small Phillips-head screws. You won't need any odd drivers to take things apart, just a set of standard (but small) screwdrivers. Question #2: What is the battery model and what does it cost? Answer: BL-T19 -- Cost (will be) around $10. The battery is very similar to that of the Nexus 5. The new battery is a bit larger in capacity. Aftermarket battery makes haven't introduced 5X replacement batteries just yet but we can look to the similar batteries in the Nexus 4 and Nexus 5 for price guidance. Batteries for these older models can be ordered for between $7 to $12 including shipping! Question #3: Can I add wireless charging capability? From Question #1 we know that it is not too hard to get to the battery. The official Google position, however, is that the battery is not user-replaceable. This alone may dissuade most users from even considering opening the case to replace a battery or add a Qi charging add-on. If that is the case, wireless adapter aftermarket companies might decide to skip the Nexus when deciding what phones to offer add-on wireless solutions for. The battery has a proprietary connector. The connector is not three little contacts in a row as found in most consumer-replaceable batteries. That arrangement makes it easy to design three contacts to sit in between the battery and the phone and so provide an internal means for a charging solution to tap into the phone's power circuit. 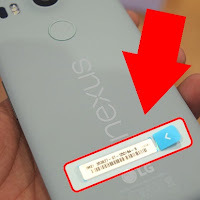 The Nexus 5X, however, uses a connector designed as a rectangular "snap". There is just enough room under the framework for this connector -- not much extra space for someone to put an intermediate "tap" between the connector and the circuit board it plugs into. A simple "tap" is out -- some sort of extension cable with integrated tap would probably be needed. Whatever the solution, it would likely need to be very specific to the 5X. The IMEI can be accessed within the Android OS itself under SETTINGS -> ABOUT PHONE -> STATUS -> IMEI INFORMATION. on the back of the Nexus 5X. Check the paperwork you saved from the box. You at least keep the owner's manuals and those little instruction cards that come with your gadgets...RIGHT? An IMEI sticker is supplied on the back of the phone's case. I recommend sticking the sticker on your owner's manual and dropping the manual in whatever special place you keep important stuff. Look inside the back cover. Although the Nexus 5X does not provide a "user-removable" back cover, the cover is absolutely "user-removable"-able. (Refer back to Question #1, above, regarding battery replacement.) Down near the lower edge of the back cover you'll find the third physical IMEI label that comes with your Nexus 5X. Question #5: Can I add an internal metal plate for magnetic car mounts? of a metal plate to the back of the phone. If you've ever seen a magnetic car mount then you probably know that such mounts require a metal plate be attached to the back of the phone. Personally I prefer to not have a metal plate stuck on the back of my phone so I like to put the plate inside the back cover (room permitting). 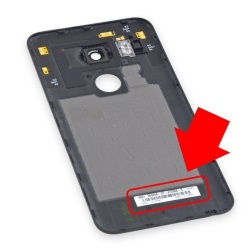 The Nexus 5X doesn't spare much interior room but, depending on the thickness of your mount's metal plate, you *may* be able to squeeze the plate in between the battery and the battery shield (the light grey piece pictured in the middle of the back cover in the interior IMEI label photo, above). Try to get "full screen" instead of "cutaway"
for greater surface area coverage. Oh my goodness -- don't pay $19.99 for that Zagg screen protector at Best Buy! Zagg's "self-healing molecule" come-on certainly sounds cool but you'll be paying 20 times too much. Instead, order a screen protector from eBay for about $1 shipped. I recommend eBay (click here for a predefined search) and a seller that ships from within the US so you get the product in days rather than weeks. A "full screen" protector is preferred over a "cutaway" style. I purchased two Nexus 5X "full-screen" protectors plus a microfiber cloth from a US-based seller for only $1.57 shipped (from eBay seller x-style720 if you were wondering). Again, while the Nexus 5X is still very new you'll find that eBay is one of your best bets for both price and selection of protective cases. You can get hard cases and hybrid cases (combines both a hard outer shell and a soft inner shell) for between $4 to $10 shipped. That's right -- starting at $4. Nexus 5X hard cases start at only $4 shipped on eBay. Personally I use a two-piece "hybrid" case that consists of a soft inner cover with a clip-on hard outer shell. Similar cases are pictured above and, yes, they also come in basic black. Unfortunately all those Micro-USB cables and chargers from your old phone(s) are now useless with your new Nexus 5X. Or are they? USB-C is still too new for truly cheap, decent cables. The best combination of quality and price can often be found at Monoprice.com. Unfortunately, USB-C is still too new even for Monoprice who has only a smattering of USB-C offerings with cables starting at a healthy $10. That's too much. Are you also a Nexus 5X owner?